Excerpted from the book Fearless Genius: The Digital Revolution in Silicon Valley 1985-2000 by Doug Menuez, Atria Books. Foreword by Elliott Erwitt, Introduction by Kurt Andersen. In 1985, documentary photographer Doug Menuez approached Apple founder Steve Jobs with a big request. He had heard that Jobs had been forced out of Apple and was starting his own personal computing company, NeXT, and Menuez wanted to document the efforts of Jobs and his team. 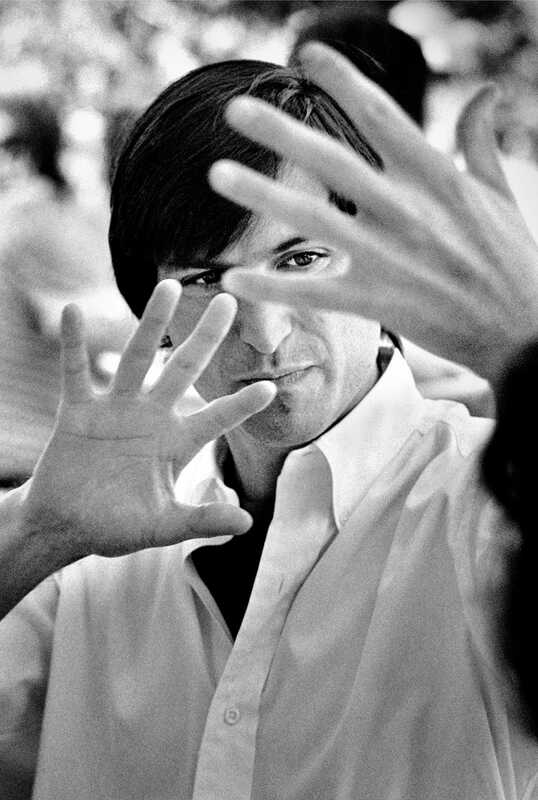 This week, Menuez is publishing excerpts and photos from “Fearless Genius” on photo sharing app Storehouse, which marks the first time many of Menuez’s photos of Steve Jobs have been available to see online. Menuez has agreed to allow Business Insider to publish a selection of his photos accompanied by his descriptions of the circumstances surrounding each moment, which you can see below. Steve Jobs Explaining Ten Year Technology Development Cycles: Sonoma, California, 1986. Excerpted from the book Fearless Genius: The Digital Revolution in Silicon Valley 1985-2000 by Doug Menuez, Atria Books. Foreword by Elliott Erwitt, Introduction by Kurt Andersen.Steve giving a history lesson about how technology evolves in ten year wave cycles to his new NeXT team at an off-site meeting. Every few months, Steve and the fledgling company’s employees would travel to a retreat in the country with their families to grapple with myriad technical issues. There he would regularly hold talks to explain his vision for the company and to encourage his brilliant cofounders and employees to participate fully in its realisation. When I asked him what he meant by this, he said he wanted “some kid at Stanford to be able to cure cancer in his dorm room.” Because he absolutely believed this was possible, his whole team did. Behind this noble goal, Steve was also on a quest for redemption and revenge after being forced out at Apple in a humiliating boardroom coup after alienating key board members and his handpicked CEO, John Sculley. Most industry pundits believed NeXT would be a huge and rapid success, as did Steve. Instead, it was the start of a decade of difficult, often bitter struggle. The Day Ross Perot Gave Steve Jobs $US20 Million: Fremont, California, 1986. 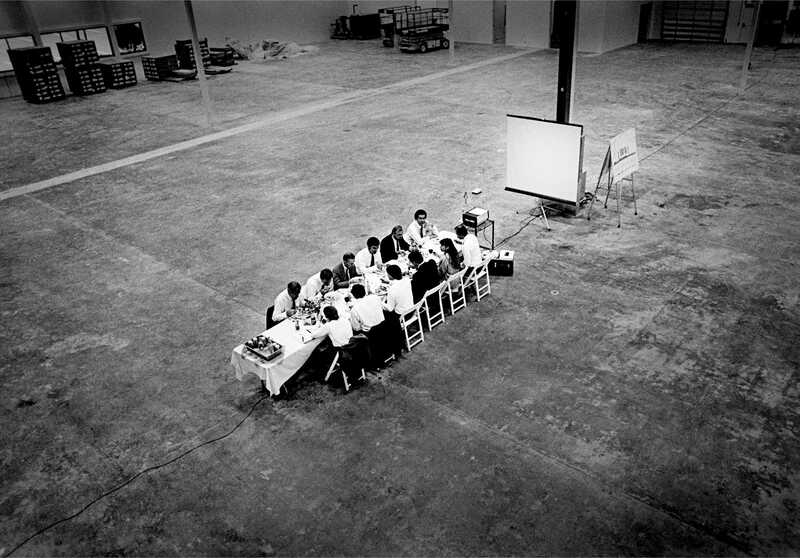 This was never more apparent than at this incongruously formal lunch he hosted for Ross Perot and the NeXT board of directors in the middle of the abandoned warehouse he planned to turn into the NeXT factory. He told Perot that they were building the most advanced robotic assembly line in the world and that “no human hands” would be assembling hardware. He predicted that NeXT would be the last billion dollar a year company in Silicon Valley and that they would ship ten thousand computers a month. Perot, who was then championing a movement to reform education in the United States, was blown away by the presentation and invested $US20 million, becoming a key board member and giving NeXT a crucial lifeline. Steve Jobs Returning from a Visit to the New Factory: Fremont, California, 1987. In the early days at NeXT he would often come bounding in, hungry to get to work. 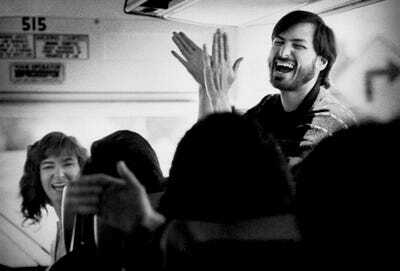 Still, there were not too many unrestrained moments of hilarity such as this one, when Steve was riding back from a visit to the newly chosen factory site with the company employees in an old, rented yellow school bus. Note: All photos used with express permission from Doug Menuez and Storehouse. To see more of Menuez’s excerpts from his time with Steve Jobs and NeXT, click here.